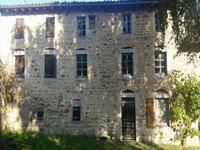 5 minutes from shops this beautiful longère to renovate, has a large barn offering multiple possibilities. A barn of 62 m² on 6 meters high. The living area 55 m² with a possibility to have 165 livable on 3 levels after renovation.